If you’re looking for a recurve bow with a budget to mid-range price tag and plenty of practical features, you will benefit from learning about the SAS Spirit 66″ Take Down Recurve Bow. This attractive design features a wood and metal design which is modern, with a touch of rustic appeal. Today, we’re going to review the main features of this model and also talk about its pros and cons. Once you’ve learned more about the SAS Spirit, you’ll have a better sense of whether or not it’s really right for you. This model is designed to be great for kids. However, it may be used by anyone who is six feet in height or shorter. This bow features tough Fiberglas construction. 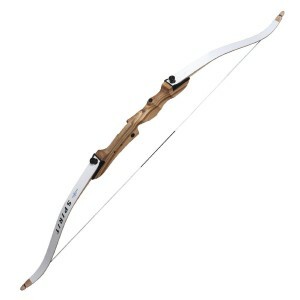 Its limb is crafted from this modern and strong material, so the bow itself is very durable. It’s built in order to stand the test of time. In addition, it comes with Maple lamination and features a shooter height of up to six feet, so it’ll work well for most people, unless they are over this height. You may choose a right or left-handed bow, according to your preference. This recurve bow features an overall length of sixty-six inches. This design is ideal for family outings and it’s also perfect for shooting in a yard or in the woods. Use it for target practice or hunting. Since it’s made from fine materials which are quite rugged, it will be flexible and tough enough to suit your child’s needs. This bow is a bending style. However, breaking it will be hard to do and this is a good thing. The riser of this design is crafted from a trio of woods, which are arborea, gmelina and chuglam. The bow has an attractive look and the woods range in tone from light yellow to cream. The tree wood used in this bow is sourced from strong trees within the Asian continent. This model is not high-end, so it may not satisfy those who want a super-deluxe model. However, it shoots very well and this is really the most important thing. If you’re looking for an affordable model, it’s lower price tag won’t be a “con”. It just depends on the price point that you’re looking for. This design earns very high rankings from real-life customers. It is designed to work flawlessly for most, although there may be a learning curve where kids are concerned. Always supervise children while they are using recurve bows. Most buyers of this model are very impressed with its shooting accuracy and they find it simple to use, so it definitely earns good reviews in the excellent to very good range. However, one customer did complain about the bow’s large holes on its end grains. This customer wished that the manufacturer had filled up the holes. In terms of praise for this model, most users found it gorgeous to look at. They love its wood and Fiberglas design elements and find it less bulky than comparable models, and therefore simpler to use. Is This Bow Right for You? If you want high quality for a fair and reasonable price, you may find that this recurve bow is a fine choice. It comes from a trusted manufacturer, is very durable and gets awesome reviews. It’s perfect as a starter bow. However, it also works well for those who do have experience. All of the recurve bow reviews will tell you this. You’ll find this model at larger online retailers. Be sure to buy from a reputable retailer which offers an authentic SAS product.